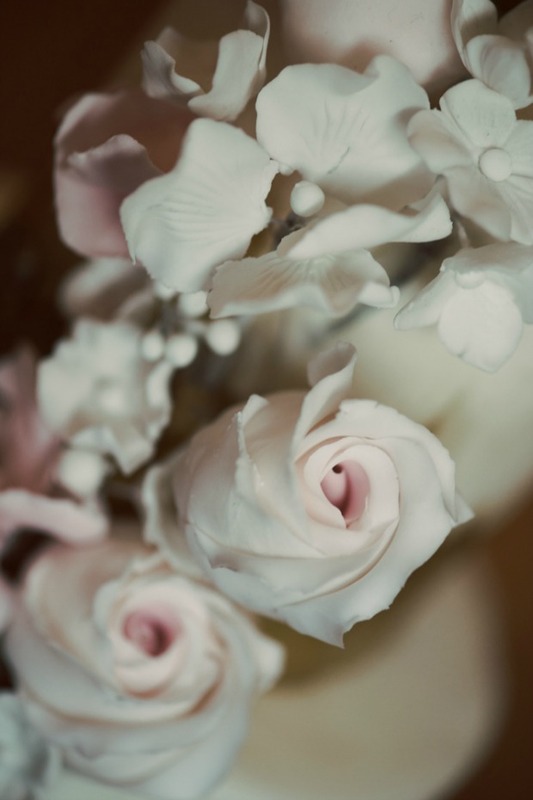 Happy Friday lovelies, I really hope you’ve enjoyed this gorgeous, gorgeous day! 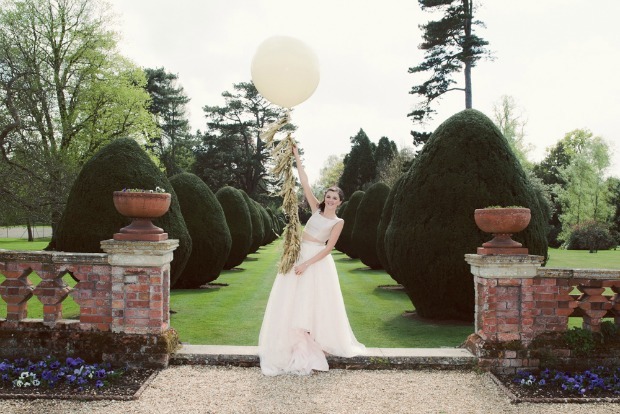 Today’s pretty styled shoot is a lovely mix between the classic and the contemporary – perfect for traditional brides wanting to dip their toe into a contemporary style for their big day. 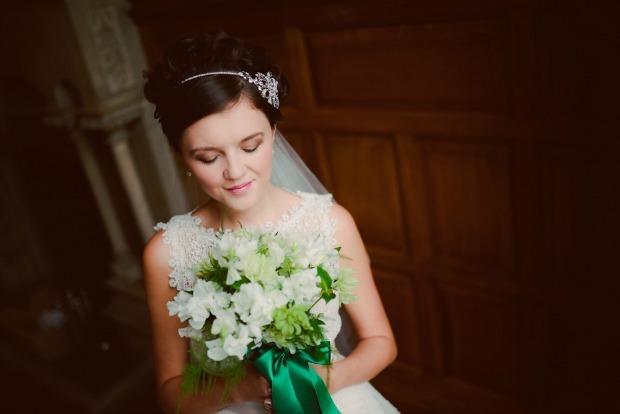 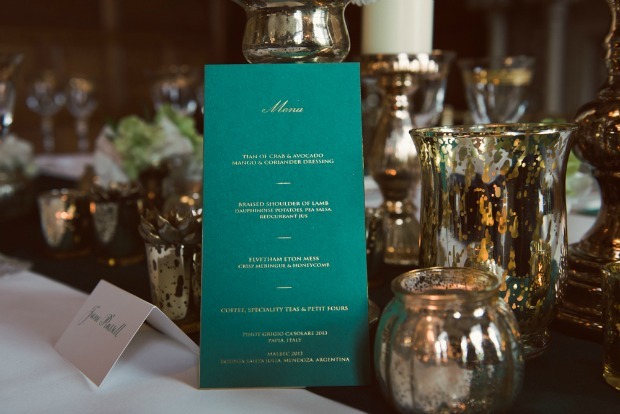 The pairing of gold, sequins and royal emerald green is super classy, modern and very elegant, and the contrast of the old world beauty of Elvetham Hotel works perfectly with the modern styling details of this inspiration shoot. 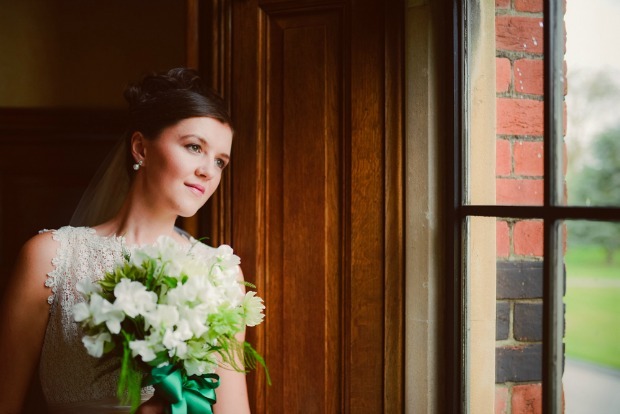 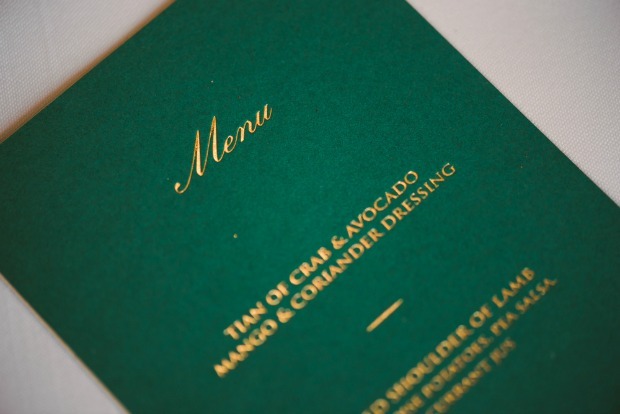 It was such fun working with some wonderful local suppliers to create a classic and contemporary shoot and exploring the grounds at the beautiful Elvetham Hotel, which was the setting for our emerald and gold styled shoot. 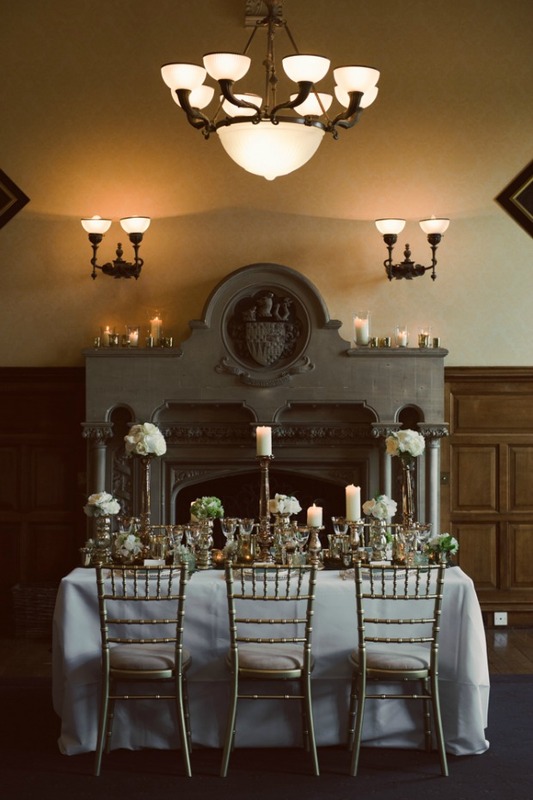 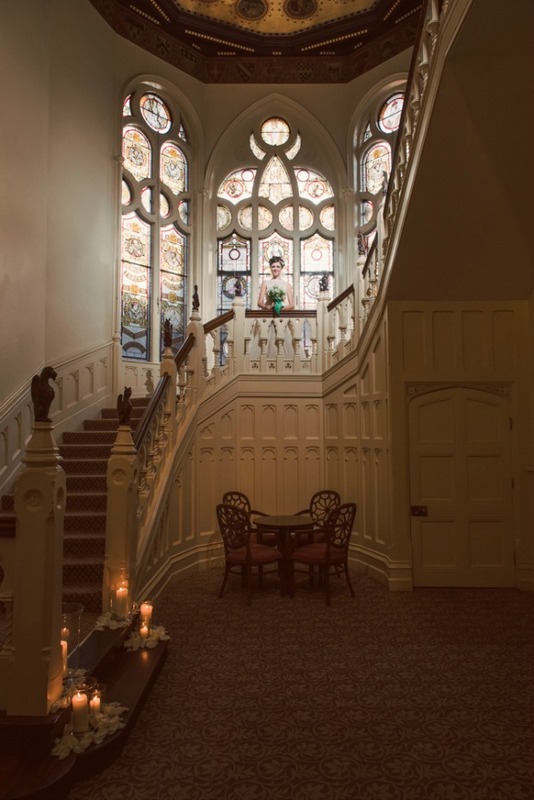 With a long standing history dating back to the 1400’s, past royal occupants and host to many a regal tudor party, it was important to keep the classic setting of the hotel whilst also adding a few contemporary touches to bring in a few of 2015’s wedding trends. 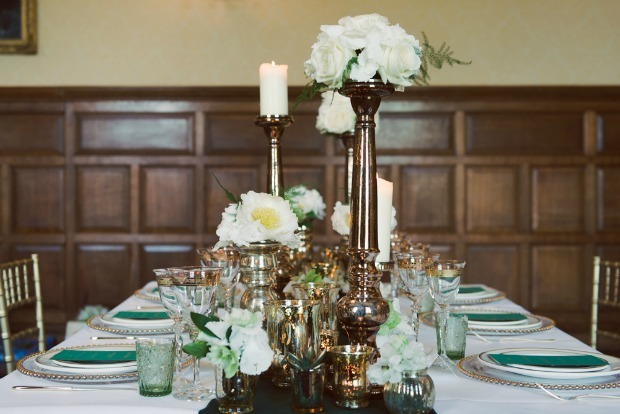 The royal emerald and gold colours work perfectly in The Oak Room in the hotel with all it’s glorious wood panelling, and adding lighter greens, blush and bright whites really compliments these colours in their setting. 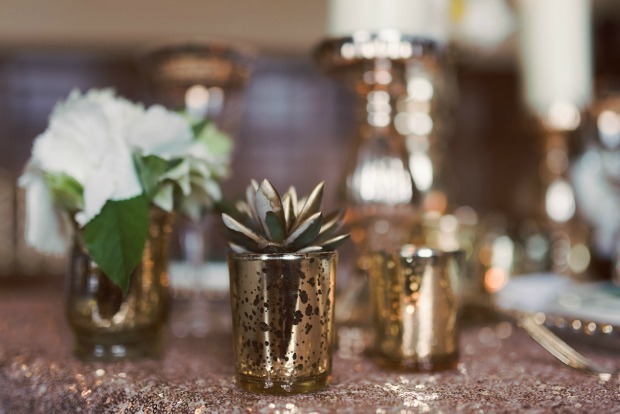 Gold is really big this year (and one of my favourite trends!) 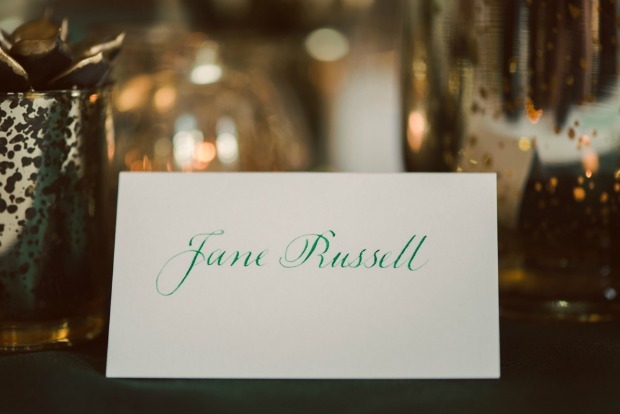 so we wanted to make sure that we had touches of gold everywhere, from the table crockery and cutlery to the cake as well as the lettering on the stationery by Prantl. 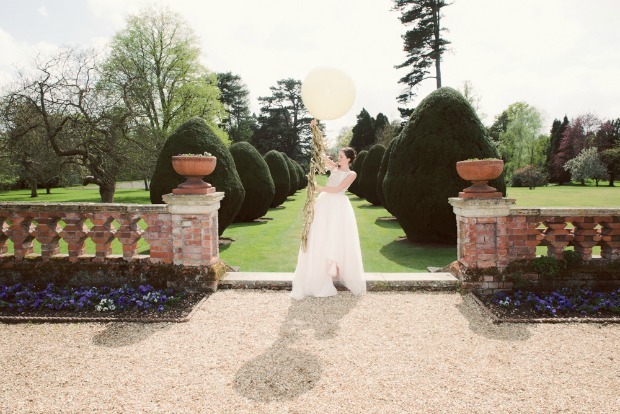 We had gold tasseled giant balloons (another really popular styling addition for 2015) and the flowers in our model’s bouquet too. 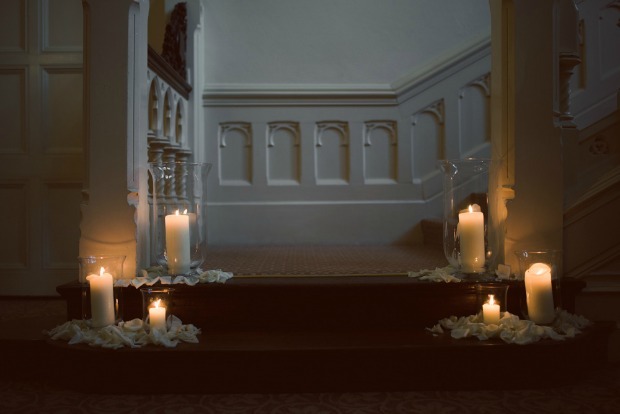 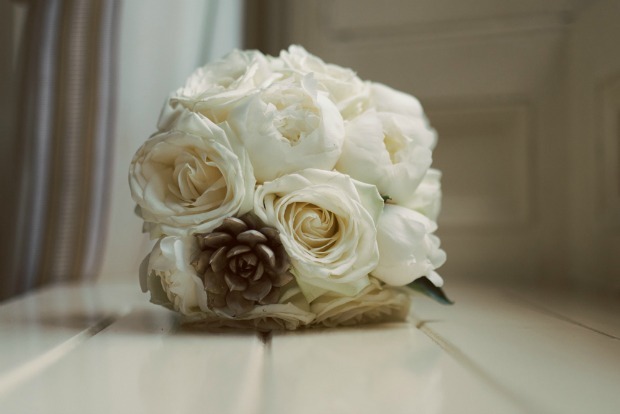 Moutan flowers created all the finishing touches to the flowers perfectly, from the mismatched candle holders to the variety and colours. 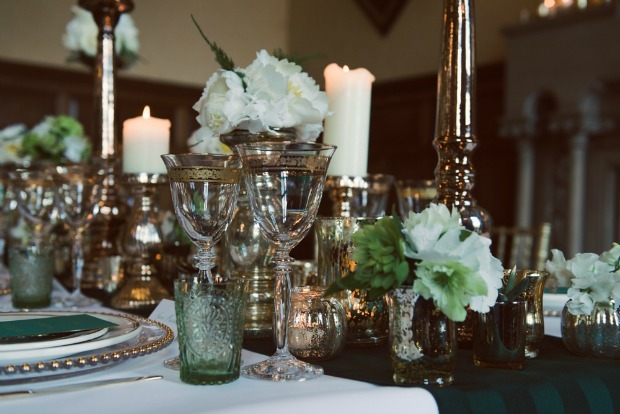 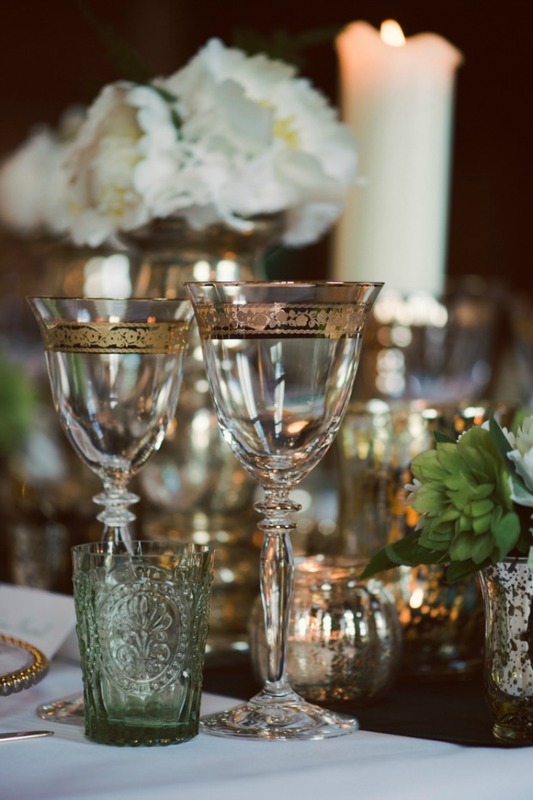 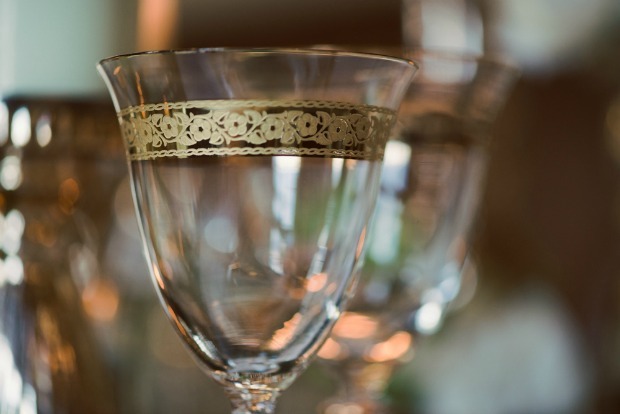 The main table was dressed with gold beaded chargers and gold rimmed crockery, to keep the gold theme throughout, as well as green cut glass water glasses and gold rimmed wine glasses. 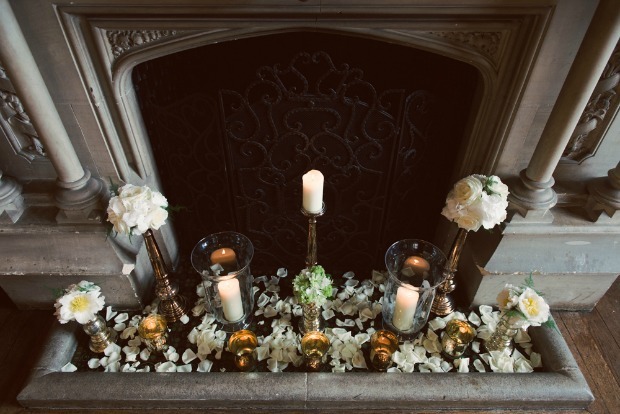 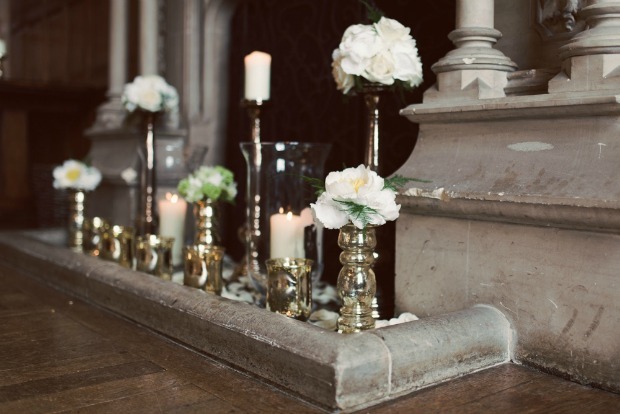 Having a straight top table in front of the fireplace really makes it stand out in this room with lots of interesting and varied florals and candles making up our centrepiece runner. 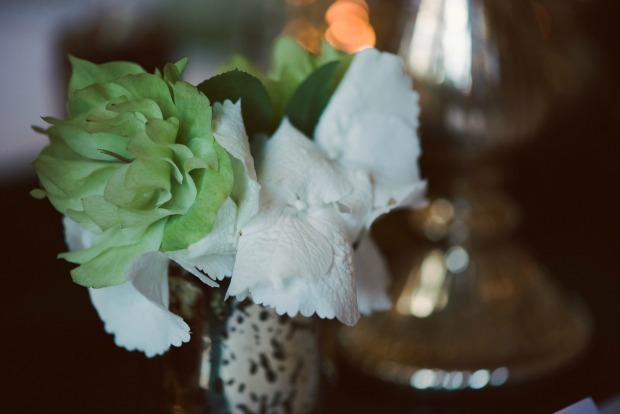 Having a roaring fire during the winter season is just lovely, but when it’s a little too warm out to have one, adding petals and candles is a pretty alternative. 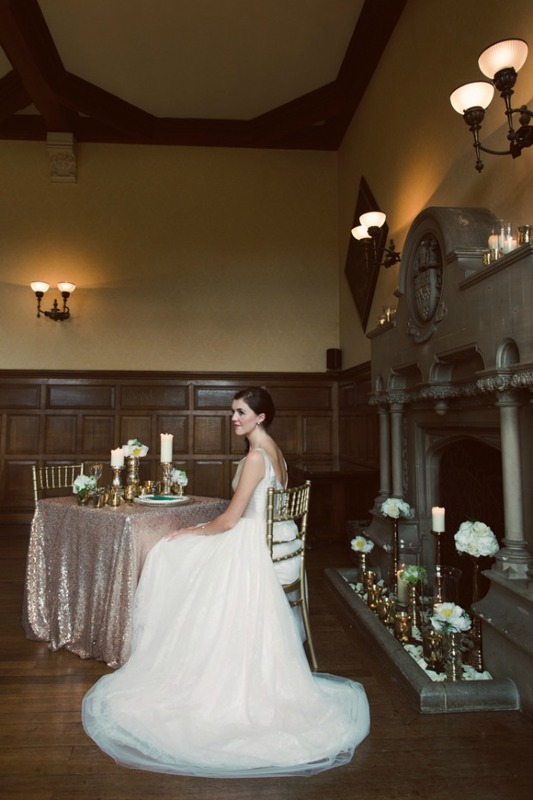 Sweetheart tables are becoming increasingly popular and what better way to make this one stand out than by using a gold sequinned cloth. 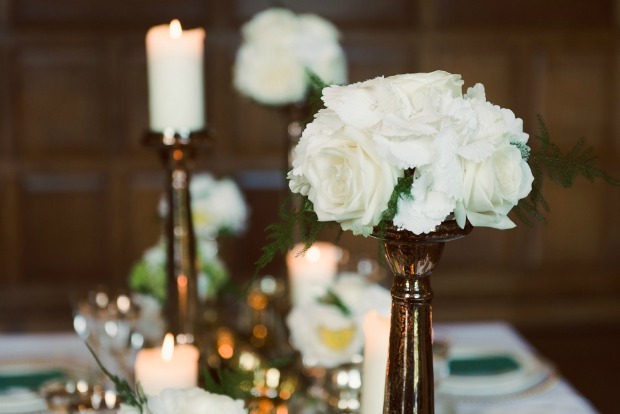 It added such a sparkle to the room and makes that sweetheart table extra special, we kept a variety of similar flowers and candles as used on the main table to keep everything styled in the same way and to compliment the overall look. 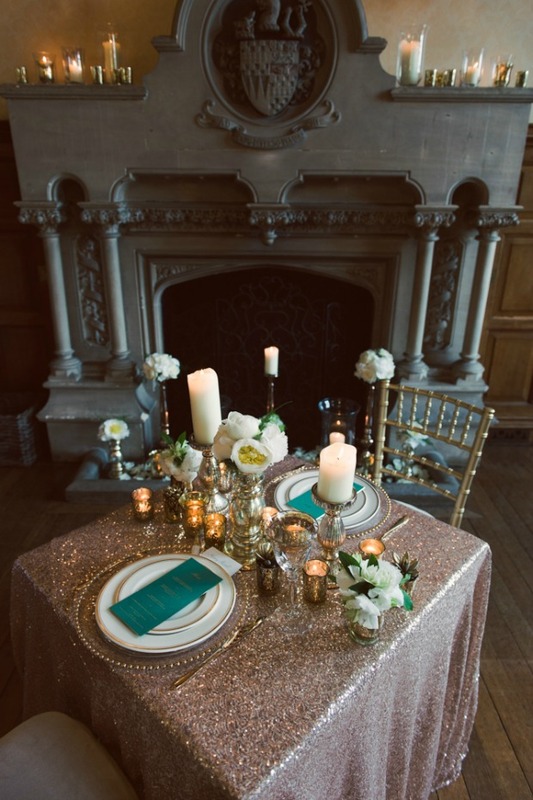 Using a sequinned cloth for the cake table mirrors the look of the sweetheart table and keeps the table simple and clean. 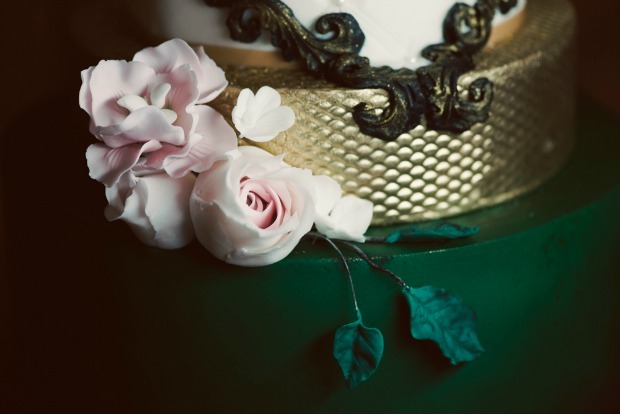 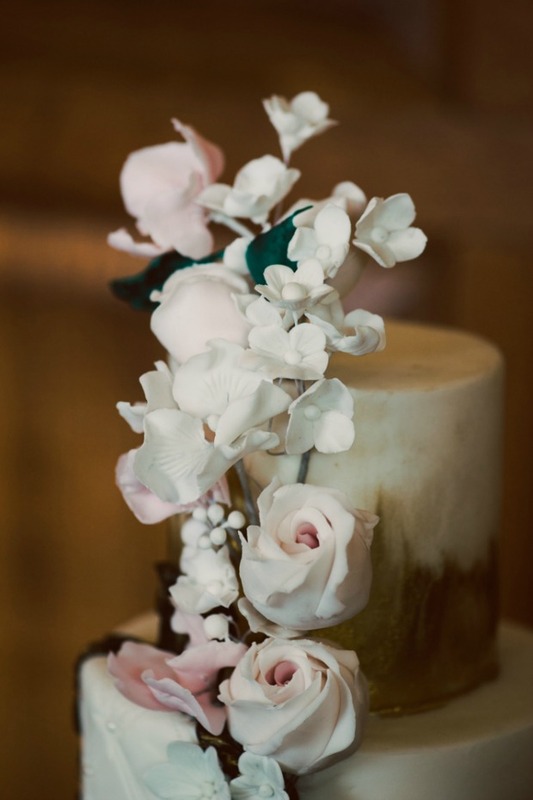 It looks great against a beautifully detailed cake like the one we had from Gifted Heart Cakes. 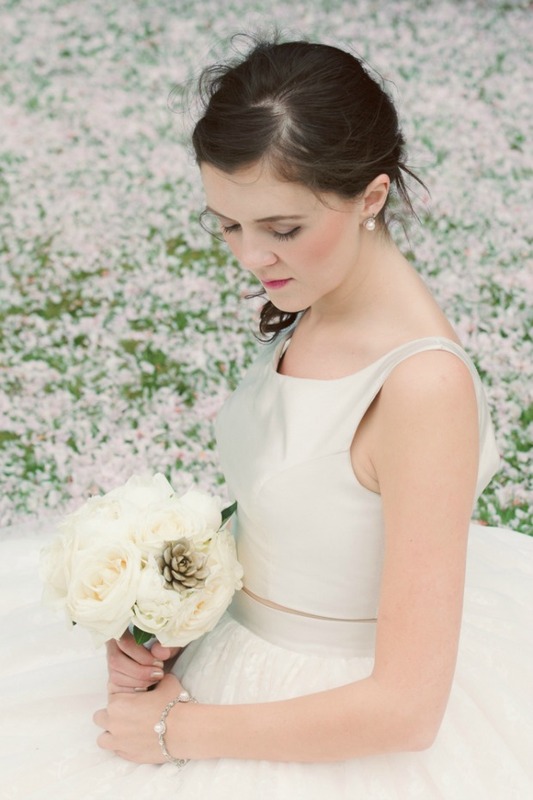 We had two dresses for our shoot, one was a So Sassi dress from Boo Bridal and the other ‘Spring’ from Bahbua. 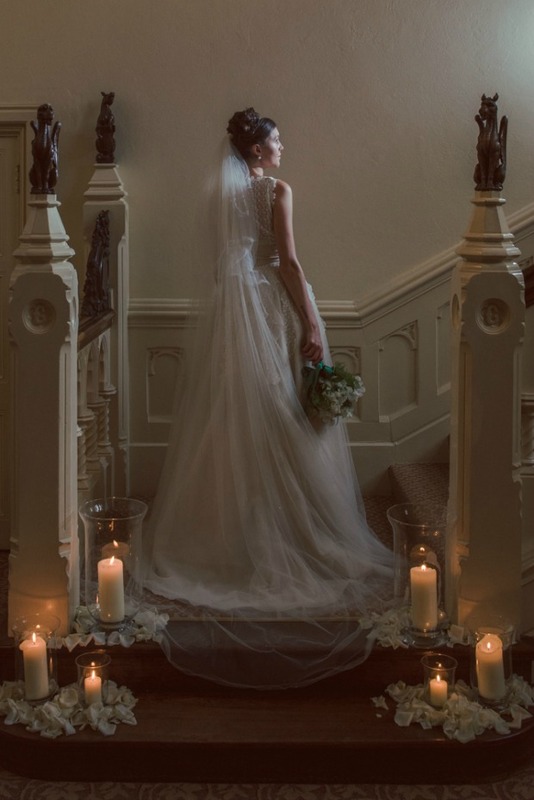 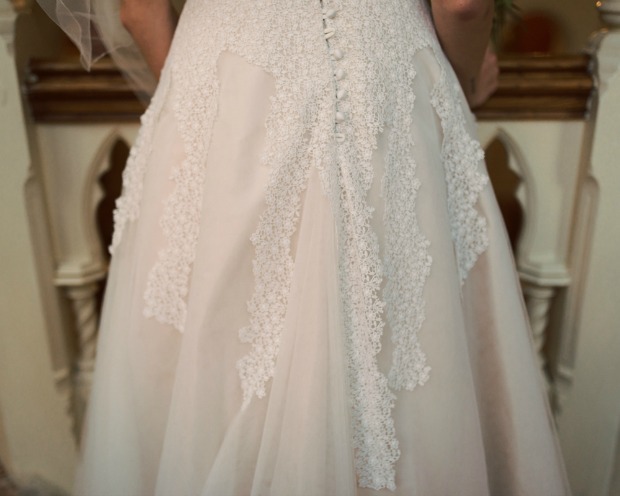 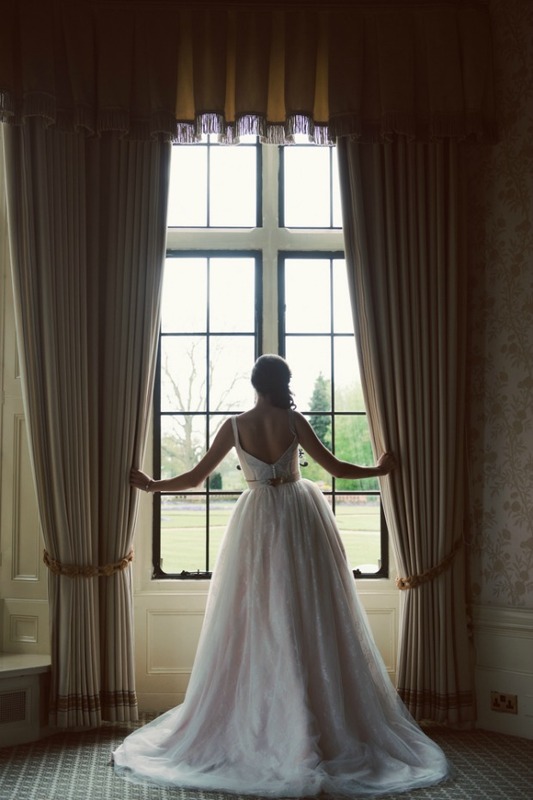 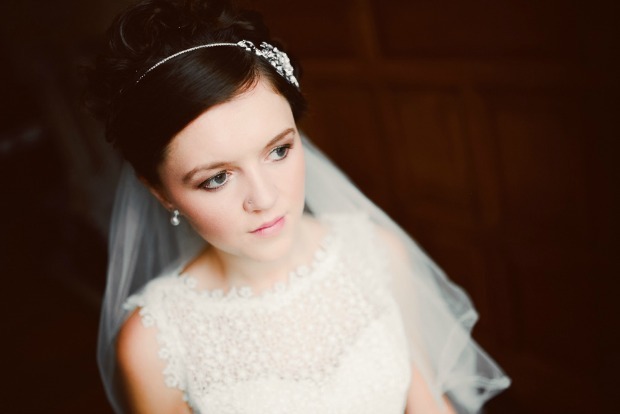 The So Sassi dress is a beautifully classic dress full of lace detailing and works beautifully in the setting of The Elvetham and all complimented with vintage hair and make up by Natasha Wiggins. 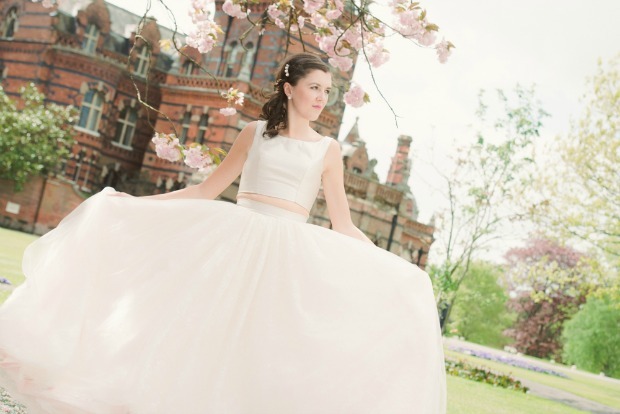 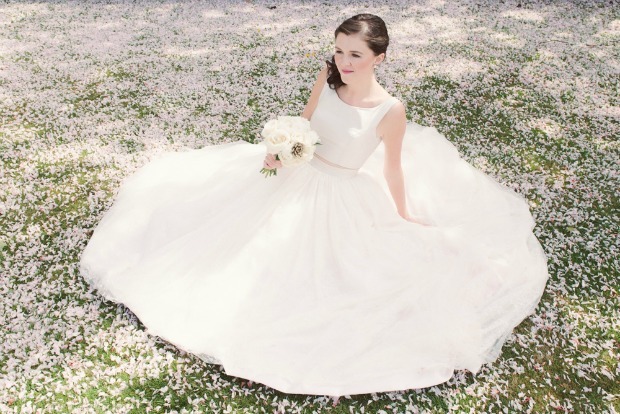 ‘Spring’ by Bahbua is a little more modern as a two piece blush dress, higher at the front but with length at the back, the dress is romantic and a more modern alternative. 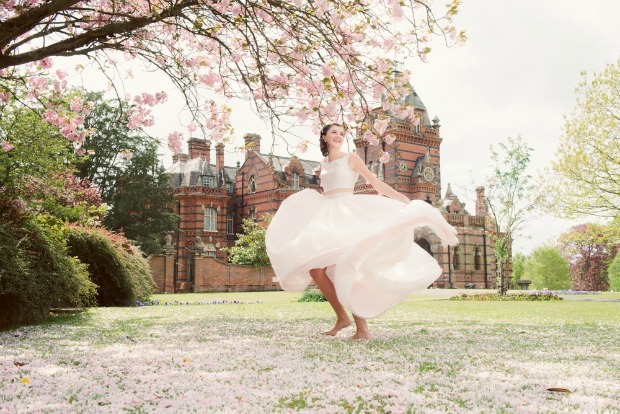 The grounds are perfect for a variety of outside shots and we were lucky enough to arrive just in time for the last blossom, so naturally, Alistair from Ideal Imaging, had to capture our lovely model surrounded by blossom! 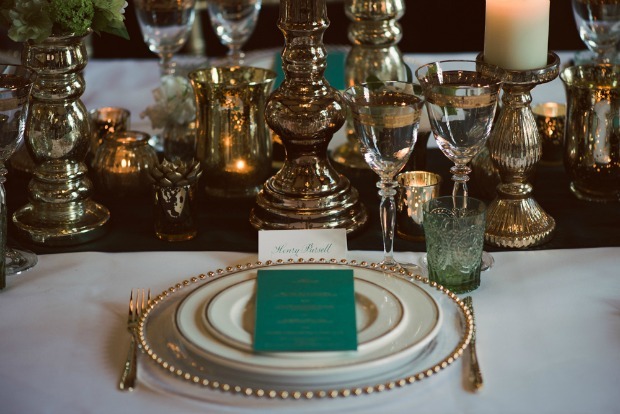 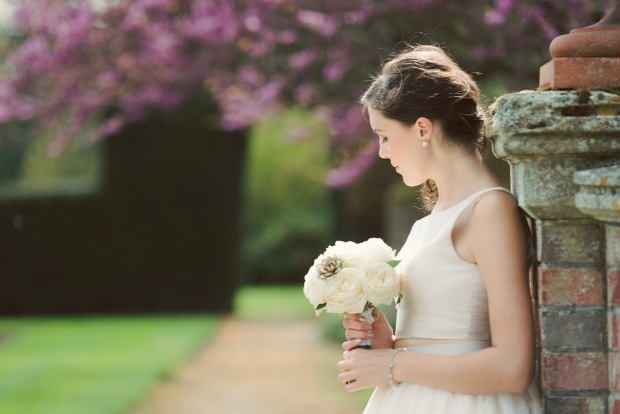 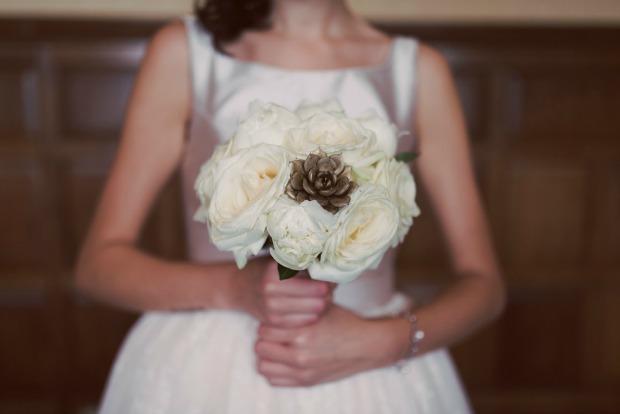 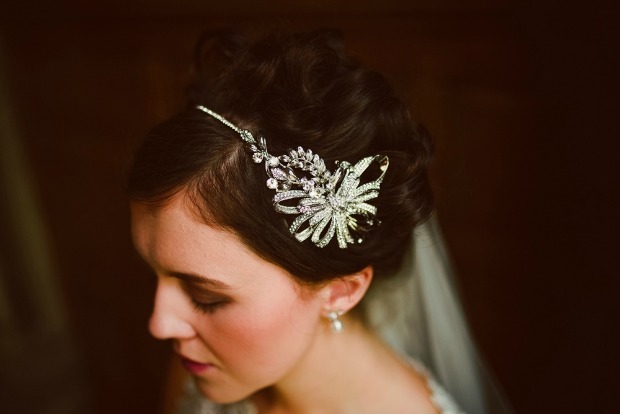 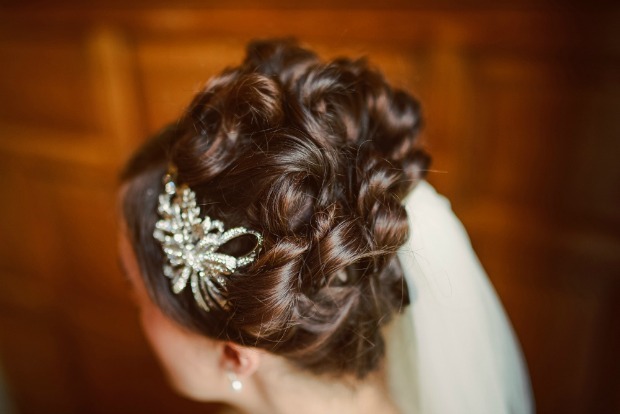 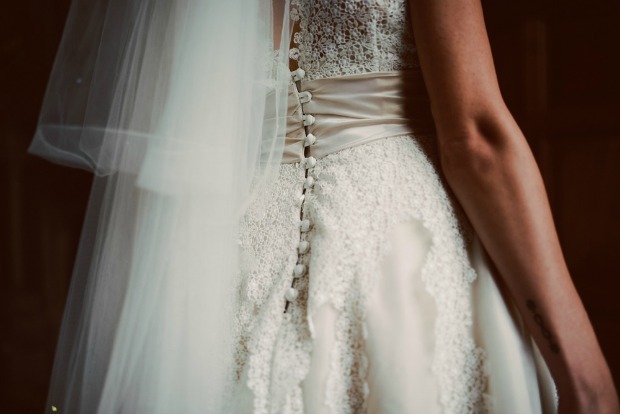 Thank you so much for sharing this gorgeous styled shoot! 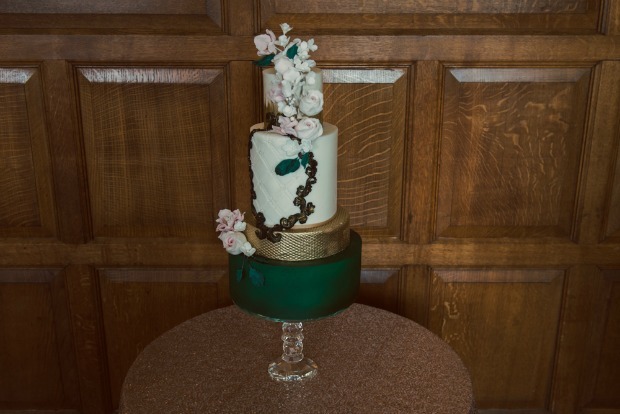 Loving the gold sequins and elegant emerald green palette – nothing prettier than a bride dancing underneath the blossom trees too. 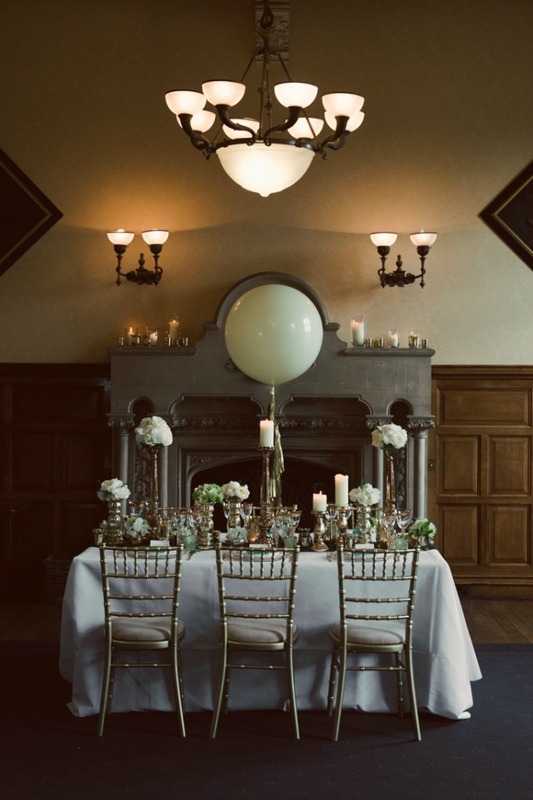 I love the Victorian inspired table decorations and what a venue!